Well-built with a user-friendly nature, this infographic maker provides the user an opportunity to create a wide range of items including brochures, presentations, pamphlets and a lot more. The wide variety of icons, templates, fonts, and options of images to select from, makes the entire experience even more interesting. A minimal rate of $1 gives you the option of buying exclusive elements and free designing icons. This app can be operated with a single touch of a finger on the Canva iPad app, and you’re good to go. Convenient, uncomplicated and free, Google charts offers a large range of charts that can easily meet the requirements of your website and merge with the overall look. Creating a real-time connection with the data, Google Charts is considered to be the most efficient and competent infographic producer. Infogram is an interesting free tool that allows you to create a wide range of maps, charts, and graphs. Data can be turned in to and Excel-style and can be edited easily by the user. The software works efficiently to convert your data automatically into an infographic. It can be later shared on social media or embedded in your website. 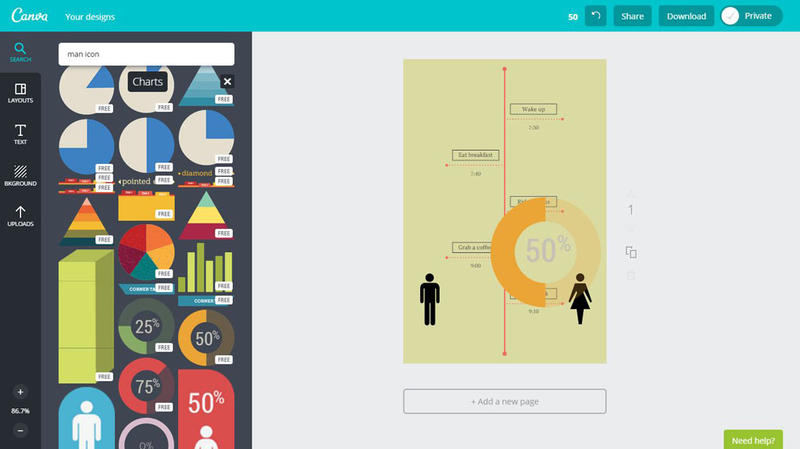 Create appealing infographics by converting tedious data with just some clicks on this tool. This particular app lets you insert graphics that have already been loaded by you along with modifying colors and fonts. The best part is the ease with which Piktochart manages the technical area such as aligning images and graphics proportionally without a lot of effort.